As promised, here’s one of the two FOs for this week – at this rate I might even have more than two! 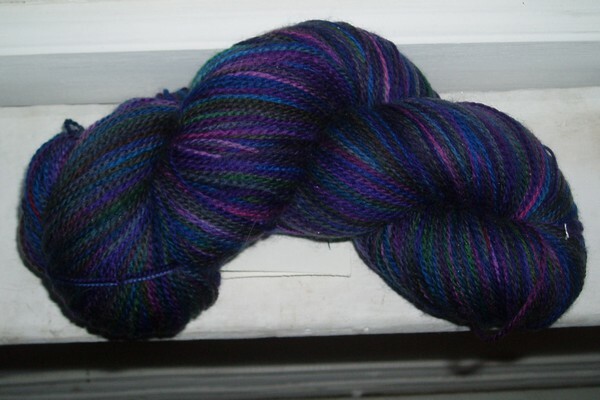 The handspun is not my handspun. 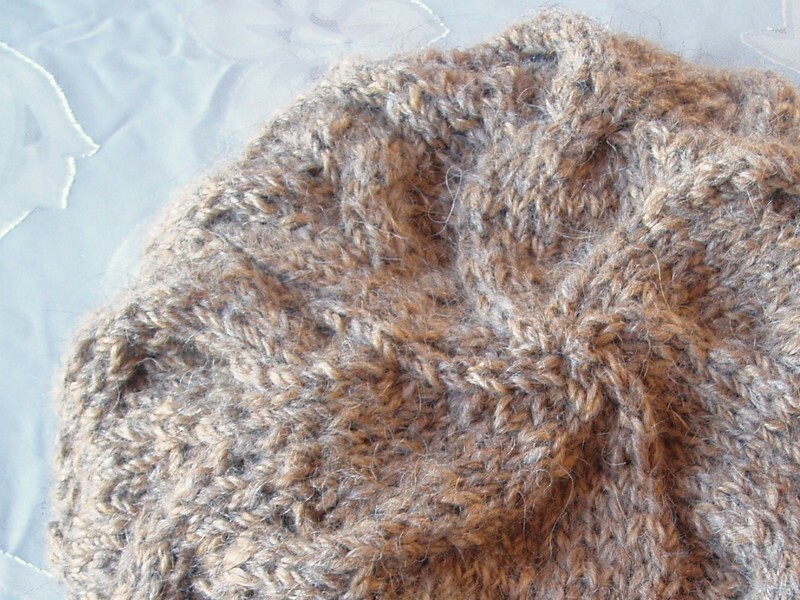 In fact, this hat is a collaboration between a few crafty people. 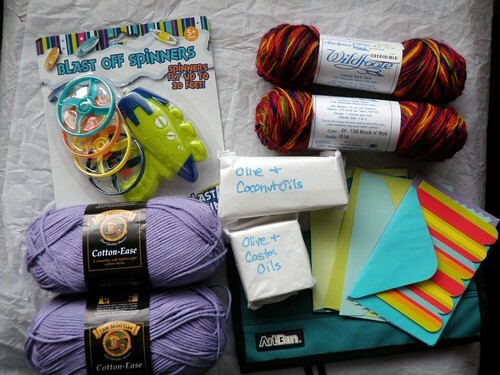 I’m part of a swap that isn’t knitting related, but quite a few knitters are in it, so I arranged to knit this for someone in exchange for a non-knitting crafty item for my swap pal. And this hat is for *her* swap pal. 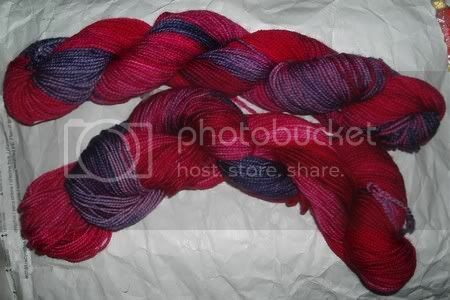 And yet another person spun the yarn, although I’m not sure what kind of swappy goodness she got. In any case, a collaboration of craftiness. 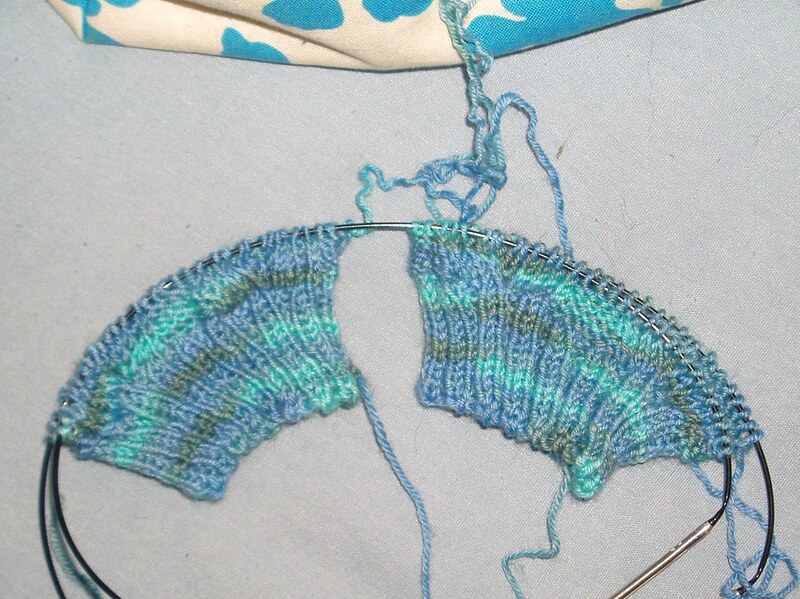 I am perpetually shocked at how fast things knit up when they’re on needles that aren’t 1s or 2s. 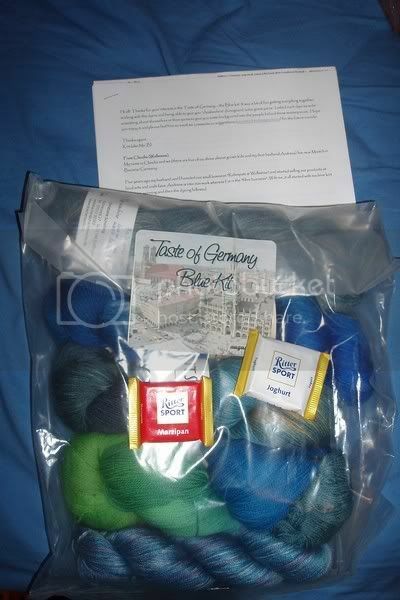 Surprising, really, use big yarn and big needles and get something quickly! 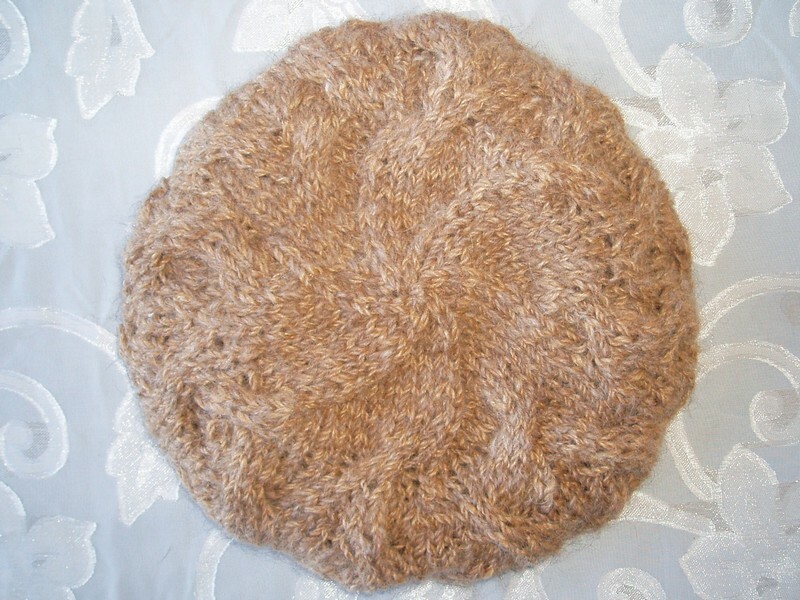 I’ve never knit a beret before, because I’m not really a hat person. My hats are only for very cold weather and I don’t wear anything fancy like berets. 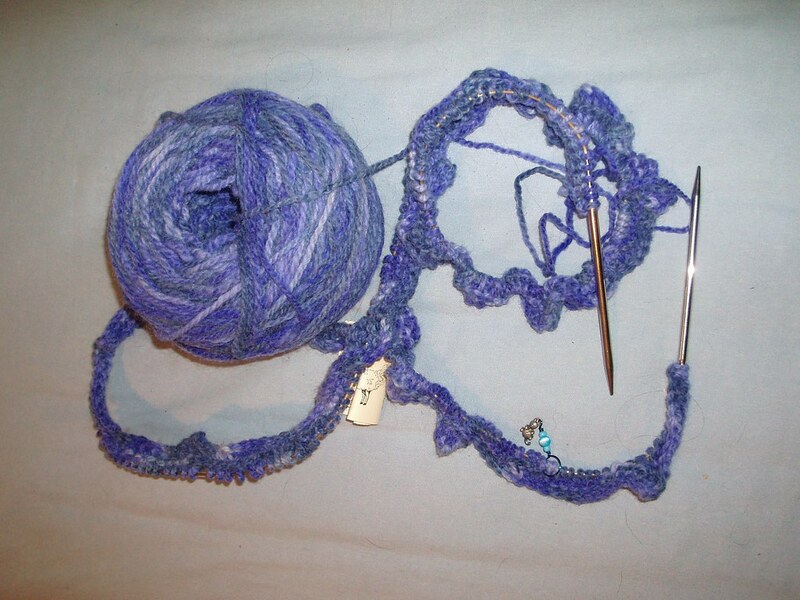 That’s one of the things I love about knitting for other people – it gives me a chance to knit things I would never wear! Remember this tragedy? 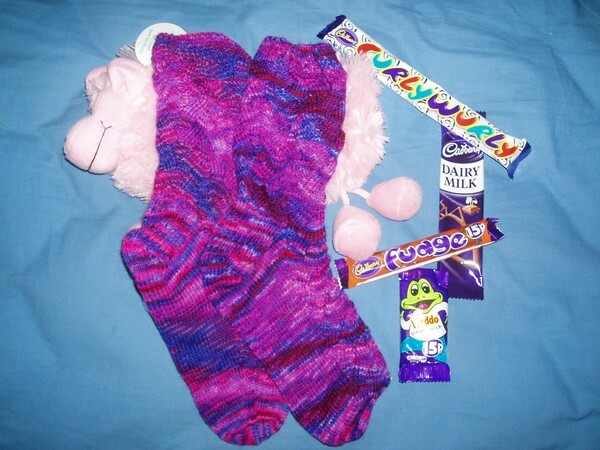 Well yesterday I got another pair of socks from Jenneke. 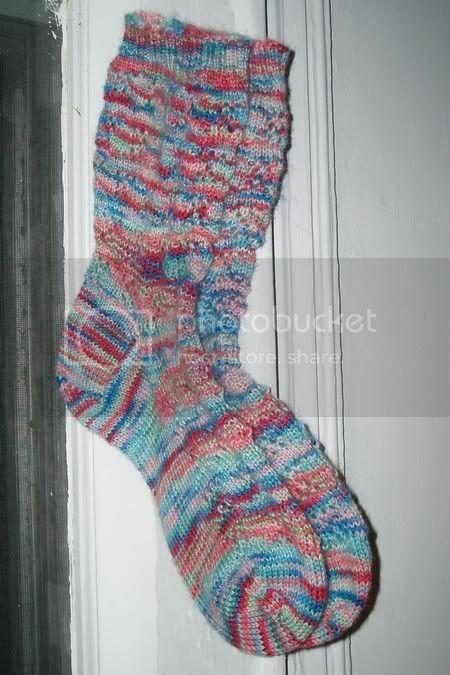 Or, rather, I got a pair of socks, but it was the second pair she sent. In any case, they are amazing! I snapped a few pics this morning before leaving for work as it was about 20 degrees and I wanted to wear my brand new socks. They’re so so pretty, super soft and comfy too! Thank you! 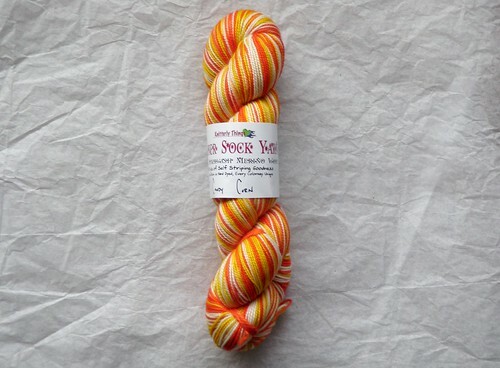 Also the fleece seems to be a hot topic – it is my Rhinebeck fleece. I bought it while I was there – you can read about it here. 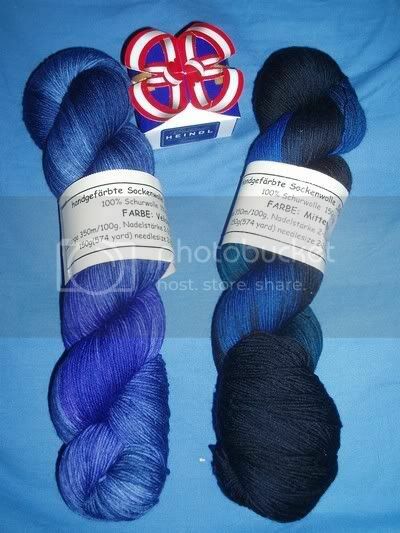 I got a colored fleece so I could dye over it to make heathery yarn, so I do plan to try that. 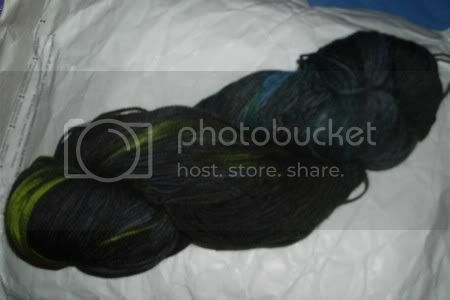 I’m not sure how much yarn I’ll get out of it, but it’s about 5-6 pounds of fiber so probably a lot. I guess that will depend on what weight(s) I spin it at too. 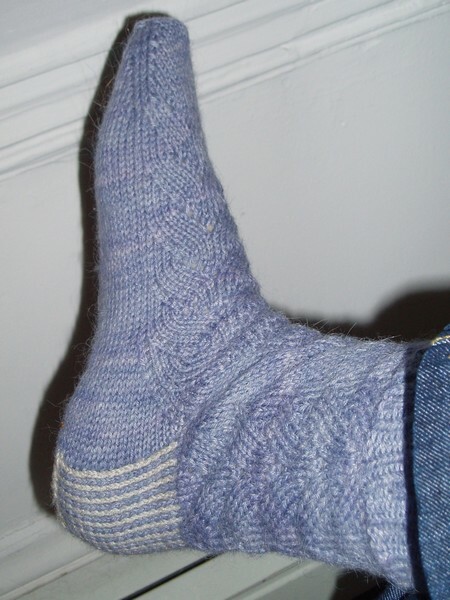 I am going to make at least one pair of socks from it, of course. 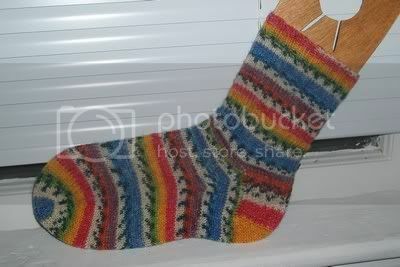 Well, the rainbow sock is finished which brings my sock count up to 90 pairs total, and gets rid of that pesky 1/2. Not too long to go til 100! 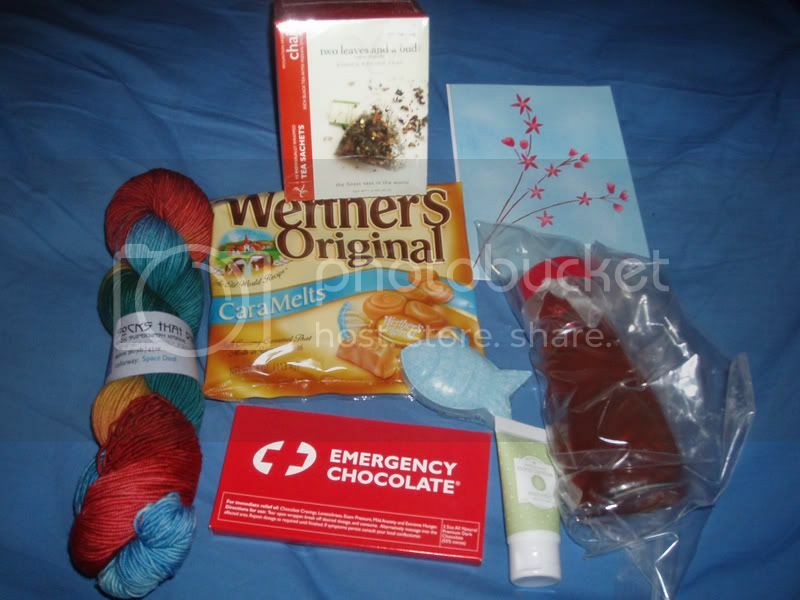 Yesterday I went to the post office and picked up a couple of packages, and then got home to find another waiting for me – a very good yarny mail day. 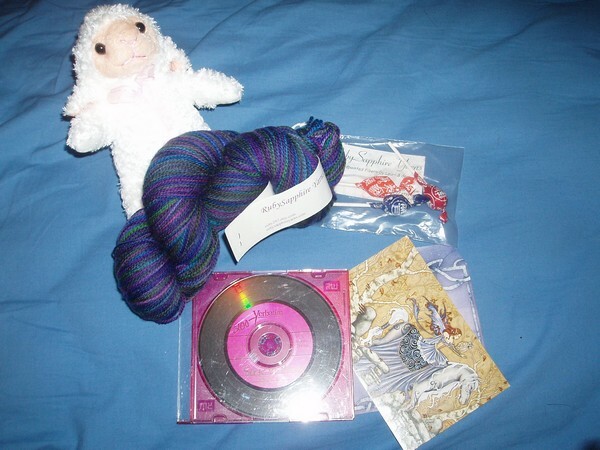 I was lucky enough to meet her this spring at Maryland Sheep & Wool along with a bunch of other knittyheads, so when she told me we had met it wasn’t *too* much of a clue. 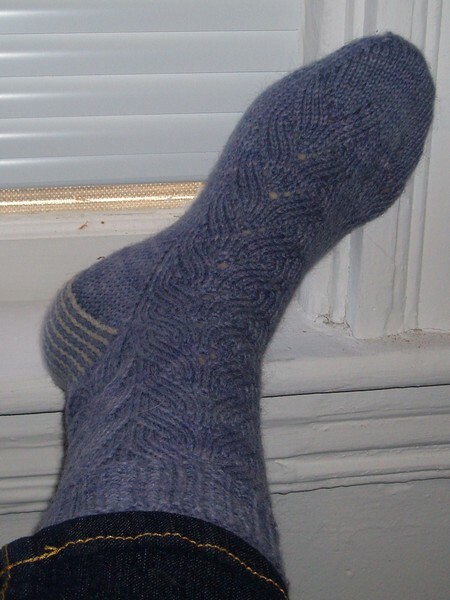 She sent some beautiful Socks That Rock in the Space Dust colorway, which was my camp name. 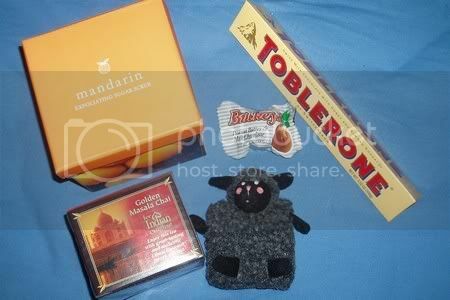 She also sent emergency chocolate, a cute fish bath fizzy, honey to go with the myriad of different kinds of chai that she has added to my collection, some more chai, Werther’s Original candies that are a little different from the normal ones, and come nice hand lotion. Thanks jochibi for being such a great pal! 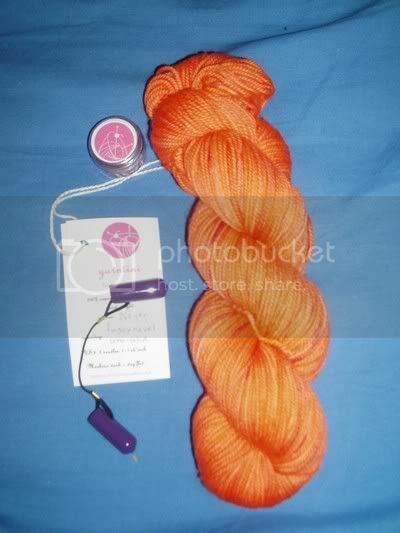 With some orange, but actually quite pretty yarn, orange lip balm, and one of those nifty little DPN holders. 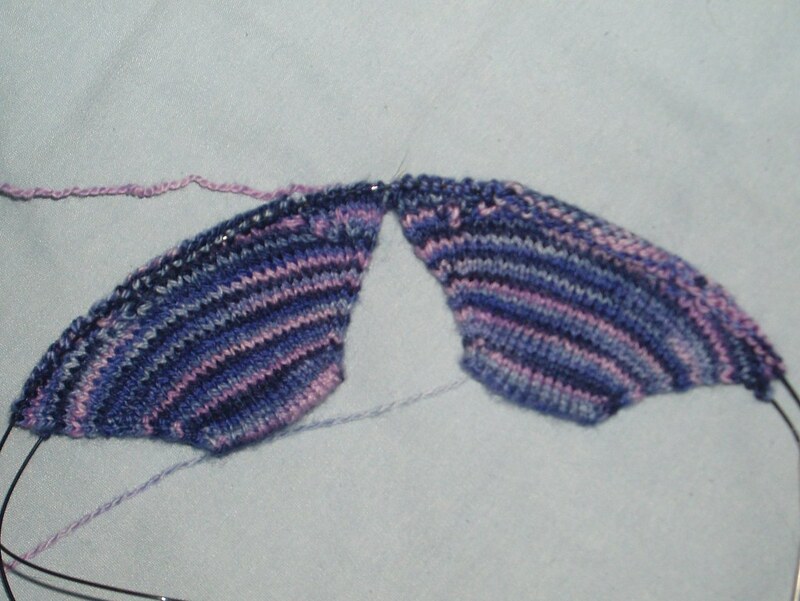 The colors are Veilchen (violet, like the flower) and Mitternacht (midnight). I’m going to leave it at that for now as I’m pretty busy, but I’ll be back later with more content, promise!